The first requires a walk to the corner of Phila and Henry streets. Late risers head to Beverly's for omelets. This spot wins over Compton's on Broadway on the basis of less grease per plate and over the Country Corner Café on Church for the art on its walls. Former favorite for decades - Mother Goldsmith's - is long gone. But the memory of its cream cheese and lox on a bagel lives on. The second is the option most advertised. 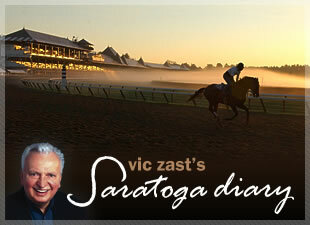 While not quite the experience it was when gentlemen in bow ties and tuxedos presented well-dressed patrons with choices from a menu, the "Breakfast at the Track" buffet with its white linen table cloths and Friday morning fashion shows provides a signature Saratoga experience. Number three, "The Brown Bagger," is a variation of the "Breakfast at the Track" theme. You schlep a blueberry muffin or a Brittany from Mrs. London's or the Bread Basket and a coffee or latte from Uncommon Grounds or Starbuck's to the clubhouse and watch the horses work out without paying a cover charge. Lastly, there's "The Morning Line." This simple backstretch food stand is one you can't tell your cardiologist about. Its stick-to-the-ribs scrambled eggs and cheese on a hard roll does your heart in. What you surrender in nutritional value, you make up for with stories about being there. When time permits, the tale about the dawn when Barclay Tagg sat on the back of Funny Cide as he ordered his coffee to go is worth telling. After seven inches of rain in nearby Kinderhook and downpours through the night locally, rubber boots were de rigueur in addition to appetites at The Morning Line on Thursday. Yet, miraculously, NYRA lost only one turf race and the main track was labeled fast - lightning fast when you consider that Working Class Hero, a $20,000, 3-year-old claimer, ran six furlongs in 1:09.43 and Kaper Lake, a 5-year-old gelding in for a $25,000 tag, won in 1:08:07. Before the day was done, another amazing thing transpired. The 5 1/2-furlong $73,230 Quick Call Stakes on the grass was won by Awakino Cat at the price of $20.20. No turf sprinter trained by Linda Rice deserves odds above 5-1 and this one paid twice the minimum. Backtalk, a son of Smarty Jones ridden by Miguel Mena experiencing his first Saratoga, ran his record to three-for-three in winning the Sanford. The crowd was light, unlike the four different breakfasts suggested.